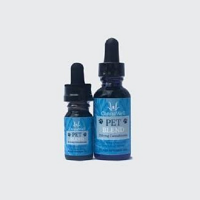 CBD Oil for Pets Many people have begun to provide hemp extracts, our legal cannabis oils to cats, dogs and other pets to support their overall health. Ingredients: 1. C02 Hemp Extract – +250mg cannabinoids per 30ml 2. Organic hemp seed oil – an excellent source of omegas 6 and 3, at a 3:1 ratio respectively. Instructions for Use: Small sized dogs/cats 2-5 drops Medium sized dogs 5-10 drops Large sized dogs 11-15 drops Some people give their pets less, others more drops. Hemp extract is generally considered safe. Cannawell Pet Blend can be mixed with food. Keep bottle once opened in a cool place or refrigerate. Not for human consumption. Always consult with your veterinarian if your pet seems ill!